Monographs of the British Herbal Pharmacopoeia 1996 (BHP) provide quality standards for 169 herbal raw materials – basically those listed for the two volumes of the British Herbal Compendium plus six others (Ispaghula Seed, Linseed, Lucerne, Mistletoe Herb, Psyllium Seed and Wild Cherry Bark). 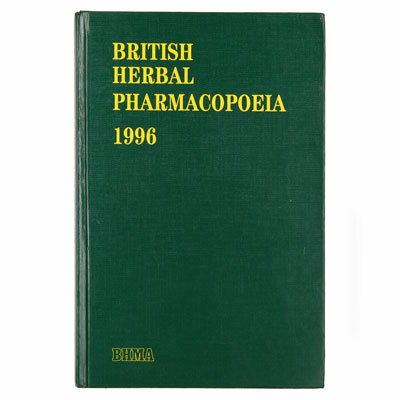 Those herbs official in the European Pharmacopoeia or British Pharmacopoeia at the time of publication are covered by abbreviated monographs in this volume. Subsequent work by the European Pharmacopoeia Commission (Council of Europe) has led to the introduction of many more herbal monographs in the European Pharmacopoeia. Nevertheless, the BHP remains a very useful aid to quality assurance, particularly for herbs not featured in official pharmacopoeias. Characteristics: Macroscopical and microscopical descriptions of the herbal material, prepared by eminent pharmacognosists, together with odour and taste descriptions. Identification: In devising techniques for comparative identification, particular attention was paid to thin-layer chromatography (TLC) with the help of chromatography specialists. All the TLC methods were designed to be within the scope of the average chemical laboratory. Complex procedures and the need for a wide range of chemical markers were deliberately avoided. Quantitative Standards: Depending on the material, these may include limits for foreign matter, loss on drying, total and/or acid-insoluble ash, amounts of solvent extractives and volatile oil. The limits were set after extensive consultation with the industry, herbal practitioners and academics to arrive at realistic control specifications for assurance of quality without excluding satisfactory materials of commerce. Quantitative assays for active principles are not included in the monographs because, in the majority of cases, it is not possible to determine which individual components within a herb are the actives. Herbs contain a complex and synergistic mixture of active compounds which rarely exhibit the same potency when isolated. Material of Commerce: A brief description of the form of the material and its main geographical sources. Powdered Material: A description of characteristic macroscopical and microscopical features. Action: Very briefly, the principal pharmacological action(s) of the herb.